What is the NEER and how is it calculated? A nominal effective exchange rate (NEER) is simply a trade-weighted average of a country’s currency (e.g. the Euro) versus the currencies of its main trading partners (and is thus also referred to as a Trade Weighted Index or TWI). The Bank of International Settlements (BIS) and most major central banks publish on their websites daily series of their currencies’ NEERs as well as any revisions to the underlying trade-weights used. In Figure 1, the Sterling, Dollar and Euro NEERs are derived from the trade weights provided by respectively the Bank of England (BoE), US Federal Reserve (Fed) and European Central Bank (ECB). Other series are derived using BIS trade-weights. I intentionally start the chart after 2008-2009 due to the impact of the great financial crisis on developed and emerging market currencies. In late-December 2015, the China Foreign Exchange Trade System (CFETS), a sub-institutional organization of the People’s Bank of China (PBoC), introduced a new exchange rate index which valued the Renminbi (CNY) against a basket of 13 trade-weighted currencies. On 1 January 2017, CFETS added a further 11 currencies and tweaked the weights of the original 13 (including cutting the weight of the Dollar to 22.4% from 26.4%). There is little difference between this series and the series derived from BIS weights (see Chinese Renminbi – Squaring the circle, 6 January 2017). 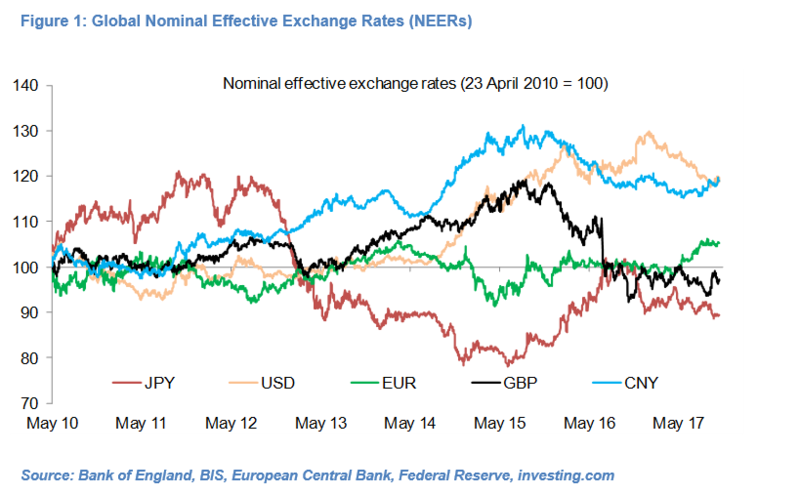 Why are Nominal Effective Exchange Rates important? Financial markets understandably focus on the most traded and liquid currency crosses (e.g. EUR/USD or USD/JPY). However, these crosses can be volatile, prey to temporary developments and ultimately fail to capture a currency’s broader performance and its possible impact on economic indicators, including growth, external trade and inflation. Moreover, there is much evidence of policy-makers, and in particular central banks, focussing on their currencies’ NEERs and using them as an input into their monetary policy decisions. These include decisions on where to set policy rates and, in particular in the case of emerging market central banks, on whether to guide their currencies by intervening verbally or in the FX markets or taking other measures. The Euro NEER has been remarkably stable in the past seven years compared to other major currencies, even if we include its 8% appreciation between April and September 2017 (see Uncertainty threatens Euro’s safe-haven status, for now, 29 September 2017). I estimate that of the main developed and emerging market NEERs, only the Singapore Dollar – which the Monetary Authority of Singapore actively manages – and the Danish Krone – which is pegged to the Euro – traded in narrower ranges than the Euro between April 2010 and September 2017. The Euro NEER was particularly stable in the 14 months prior 20 April 2017, trading in a 4%-wide range. A key implication is that the Euro has significantly underperformed the Dollar and Renminbi and, until the June 2016 UK referendum on EU membership, Sterling. There are a number of reasons for this underperformance, including slower Eurozone economic activity following the great financial crisis and arguably the ECB’s penchant for a stable and competitive currency given the importance of merchandise exports in open Eurozone economies. The Euro’s competitiveness has in my view, along with the lagged impact of the ECB’s QE program and pick-up in global growth, been a contributing factor to the recent recovery in Eurozone GDP growth and underpinned the strength of German exports, which has in turn boosted the Euro’s attractiveness relative to other reserve currencies. Between April and September 2017 it was the second best performing major currency (after the Czech Crown) and I would go as far as to say that it enjoyed safe-haven status. The Euro’s rally has stalled in the past month as markets seek clarity, amongst other things, on i) the future of the ECB’s Quantitative Easing (QE) program, ii) the composition of the German government following recent federal elections which saw the ruling CDU-CDU well short of a Bundestag majority, and iii) the issue of Catalonia’s bid for independence. But despite these macro and political challenges and the apparent willingness of the Fed and BoE to hike their policy rates in coming months, the Euro has proven remarkably resilient. Assuming, as I do, that clarity is provided to the above issues in coming weeks, this leaves the Euro in a good position to resume an admittedly slow upward trend. I expect the ECB to announce at its 26th October policy meeting an extension of its asset purchasing program into 2018 albeit with lower monthly purchases (from €60bn currently). Lower sovereign and corporate yields for longer would continue to drive economic activity and cap the risk of systemic defaults. 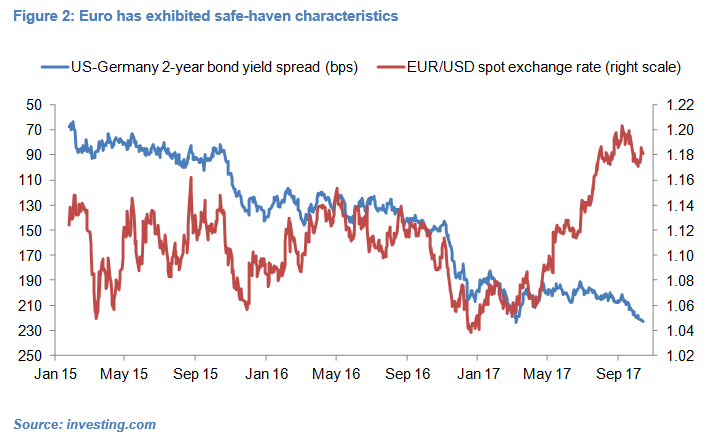 This would be positive, not negative, for the Euro in my view based on the recent relationship between the EUR/USD cross and government bond yield spreads (see Figure 2). The ECB may well continue to gently warn against currency appreciation and volatility, but with the Euro still within its long-term range and Eurozone activity continuing to inch higher, I do not anticipate the ECB to stand in the way of, let alone reverse, gradual Euro appreciation. On the politics front, my core scenario is that German Chancellor Merkel’s centre-right CDU-CSU, which is 109 seats short of a parliamentary majority, will avoid ruling with a minority government or calling another set of elections. It will likely instead renew a majority coalition with the centre-left SPD or form a three-way government with the Greens and liberal FDP. Either way, I would expect a degree of policy continuity and familiarity for financial markets (see Asymmetric data and event risk, 22 September 2017). Finally, there are signs that Catalonia’s leaders are willing to discuss with Spanish Prime Minister Rajoy the possibility of the region remaining within Spain in exchange for greater devolved powers. Sterling’s collapse in the wake of the June 2016 referendum on EU membership has been well documented, including in my research notes (see www.olivierdesbarres.co.uk ). 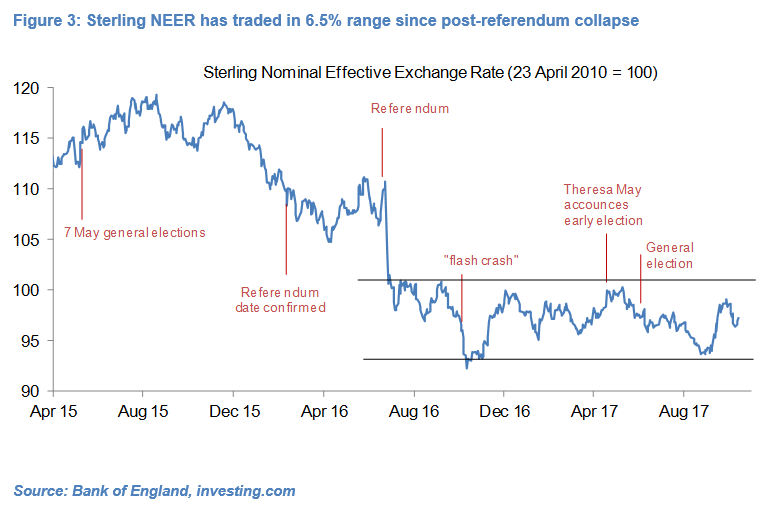 What is perhaps more interesting is that the Sterling NEER has traded in a 6.5% range since end-June 2016 if the October 2016 flash-crash is excluded (see Figure 3). In the past three months the Sterling NEER has traded in an even narrower 5.5% range, in line with my expectations (see UK: Land of hope & glory…but mostly confusion, 7 July 2017). In level terms, the Sterling NEER is actually trading exactly where it was back on 7th July, according to my estimates, and broadly in the middle of its 15-month range. Uncertainty is still the by-world for the UK’s Brexit negotiations with the EU, Prime Minister May’s government is weak and divided and EU negotiators refuse to concede much ground, but some modest progress has been made. In particular, the British government seems to have finally settled on a two-year transition (or implementation) period after the UK has left the EU in March 2019. On the macro front, there is evidence that UK GDP growth picked up in Q3 from a lacklustre 0.3% qoq in both Q1 and Q2, with the NIESR predicting 0.4% (preliminary data will be released on 25th October – see data and events calendar in Asymmetric data and event risk, 22 September 2017). 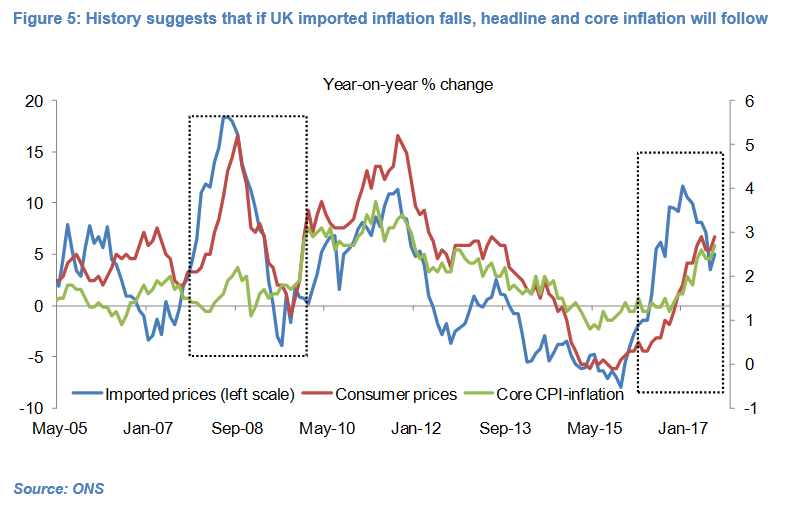 Along with rising CPI-inflation, this has emboldened the BoE to strongly hint at a 25bp hike at its 2nd November meeting – which would effectively reverse the post-referendum emergency rate cut in August 2016. At these levels, I would argue that the risks to Sterling are broadly balanced. Markets have almost fully priced in a 25bp hike next month and the risk is that the BoE cools expectations of future hikes due to still rather tepid macro data. 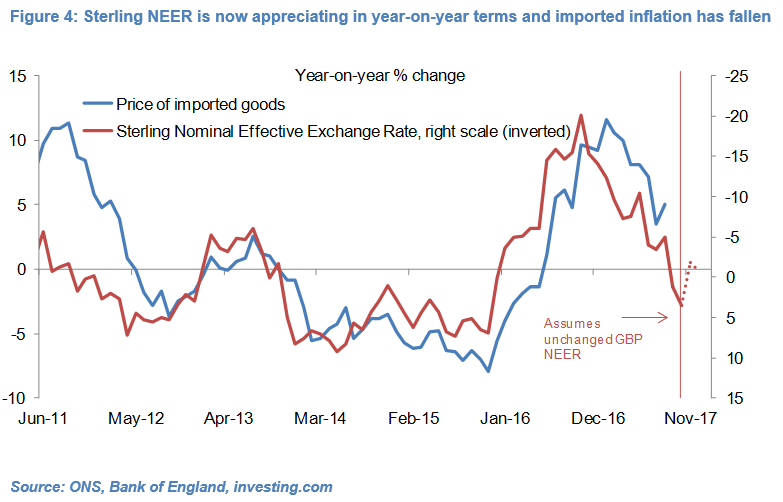 There is still little evidence of wage-price inflation and the stability in the Sterling NEER has led to year-on-year currency appreciation and in turn lower imported inflation (see Figure 4). But Sterling weakness has also fuelled tourism revenues while employment continues to rise, which is in turn sustaining retail sales. At the same time, surveys point to modest manufacturing output growth. Negotiations over Brexit are characterised by one step forward, one step back but with the clock ticking there is evidence of Theresa May’s government being willing to compromise and concede in certain areas, while markets have seemingly grown a thick skin to delays and proliferation of contradictory headlines. Following the PBoC’s surprise decision to “devalue” the Renminbi 2% on 10th August 2015, market concern focused on the possibility of the PBoC allowing and encouraging a rapid and sustained currency its currency in order to boost exports (and a shrinking current account surplus and FX reserves) and ultimately support economic growth. 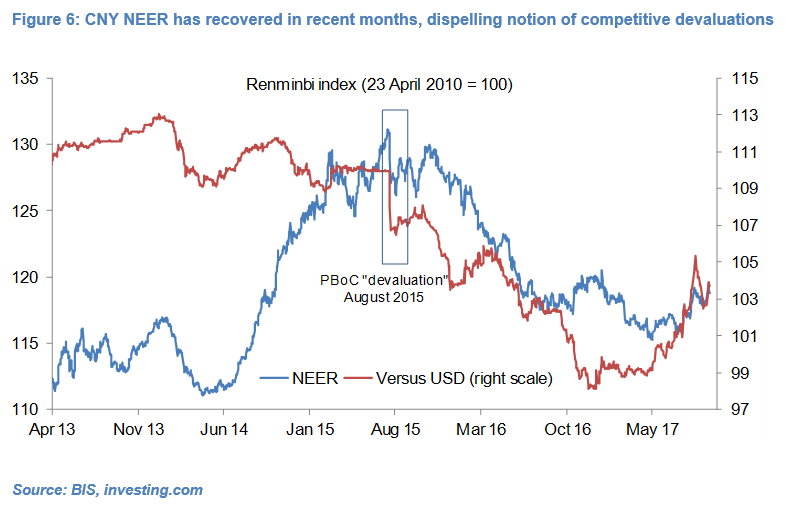 But while the CNY NEER depreciated 10% between August 2015 and March 2017, it has since been range-bound and nearing the levels which prevailed in late-2014 (see Figure 6). This, in my view, partly reflects the PBoC’s willingness and ability to use FX reserves to shore up its currency and introduce capital controls to mitigate FX outflows. More broadly, it would indicate that the PBoC sees value in a stable currency and, and at times, even a stronger Renminbi. A stronger currency not only placates a US administration concerned about its trade deficit with major trading partners, but also curbs the local-currency cost of repayments on FX-denominated debt and helps cap any inflationary spikes. 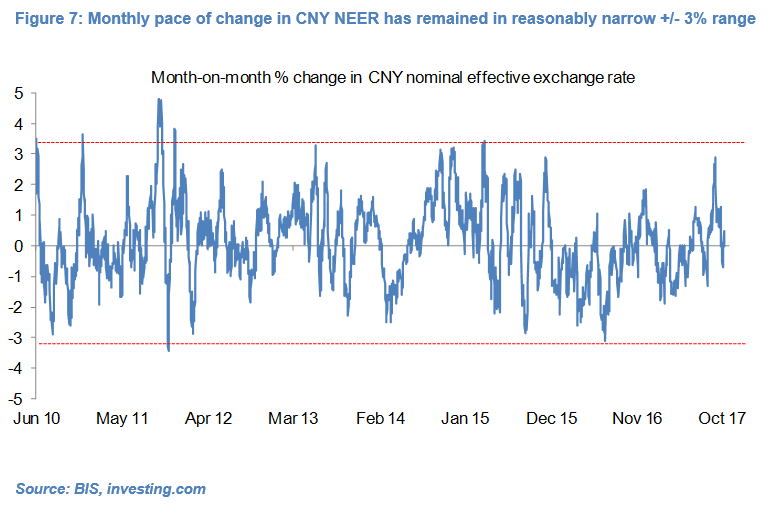 I would argue that this willingness and ability to control the pace of CNY changes, if not its medium-term direction, is reflected in a rate of monthly CNY appreciation and depreciation which has largely remained within a +/- 3% range in recent cent years (see Figure 7).